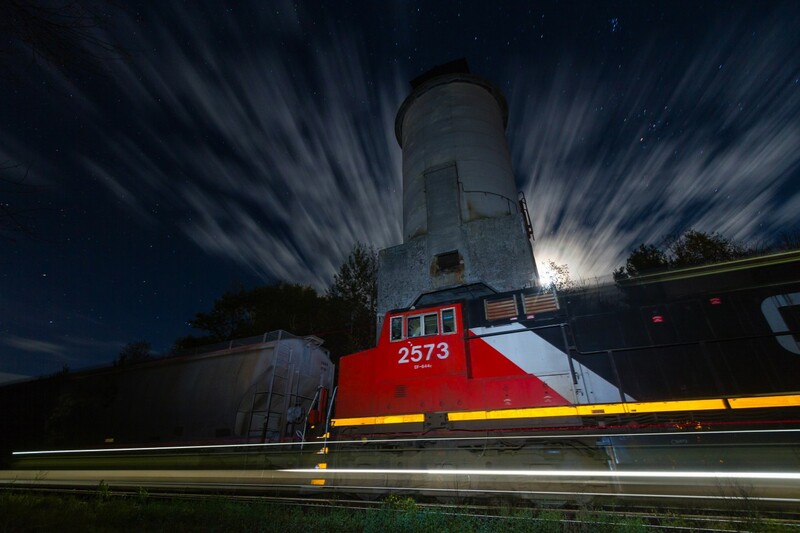 Railpictures.ca - Ryan Gaynor Photo: As the moon rises and clouds blur across the night sky, Canadian National G878 rolls past the ancient coaling tower in the sleepy town of Washago, Ontario. With G878 moving at a steady 15 M.P.H through town, the motion in this scene was both frozen by my external flash and accentuated by a 59 second exposure. As some of you may know, today I launched a web series called Railway Ties! The series will explore various aspects of Canadian railroading, as told from the unique first-person perspective of the train. Coincidentally, the pilot episode entitled “Canada’s Freight Train” features a scene from this same location. After all, Washago has long been one of my favourite places to watch trains… To view the pilot episode of Railway Ties and see this familiar location under the cover of a late winter’s snowstorm, click the following link: https://www.youtube.com/watch?v=SJzDNKuVnp8 | Railpictures.ca – Canadian Railway Photography – photographie ferroviaire Canadienne. Thank you very much for the kind words, all! I’m really glad to hear that you folks enjoyed the first episode of Railway Ties, and this photo as well. Great work on both fronts Ryan. I watched that on YouTube. I subscribed to it. It’s a very excellent first person narrative, and it’ll make for a great documentary. All the stuff I’m using on my desk, heck in my home, I’m willing to bet they took a ride behind a train. This is amazing and evocative. Wonderful shot. Neat photo, Ryan! Also, I very much enjoyed watching the first episode of Railway Ties. Congratulations on your web series – it looks very professional… keep up the great work!